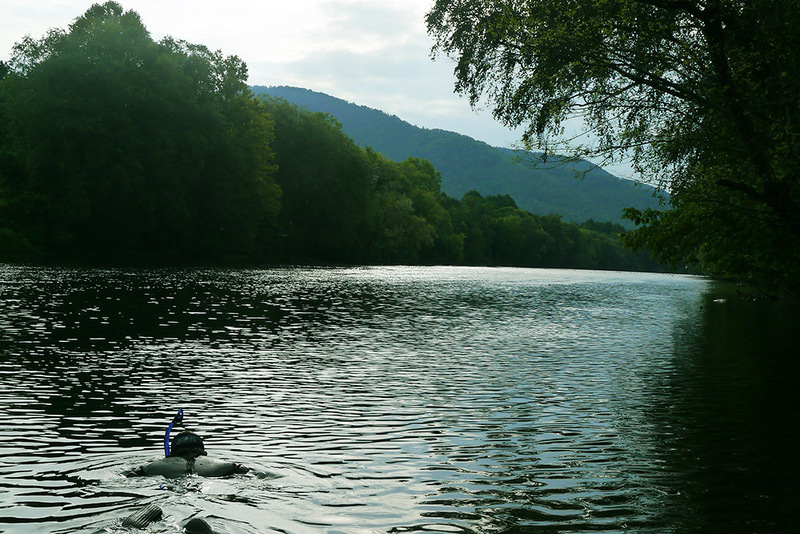 The Hiwassee River ripples like a slippery salamander, reflecting the flinty color of the sky. Then Stephen Nelson’s head breaks the smooth surface, and he rises from the chill water with a gasp, holding a gallon Ziploc bag. His scuba mask and labored walk toward shore give him a robotic look as water pours off his wetsuit. Nelson yanks off his mask with a smack, revealing eyes pinned to the bag. It’s half full of water in which swims a sleek, shadowy creature normally accustomed to hiding in dark, wet corners. It’s small for an animal, but big for a salamander. “It’s a common mudpuppy,” says Nelson, a herpetology keeper at Zoo Knoxville. The salamanders supposedly got their common name from making high-pitched whines when distressed, rather like a puppy’s bark. But Nelson has never heard one utter a sound. This animal both is, and isn’t, what he was seeking. 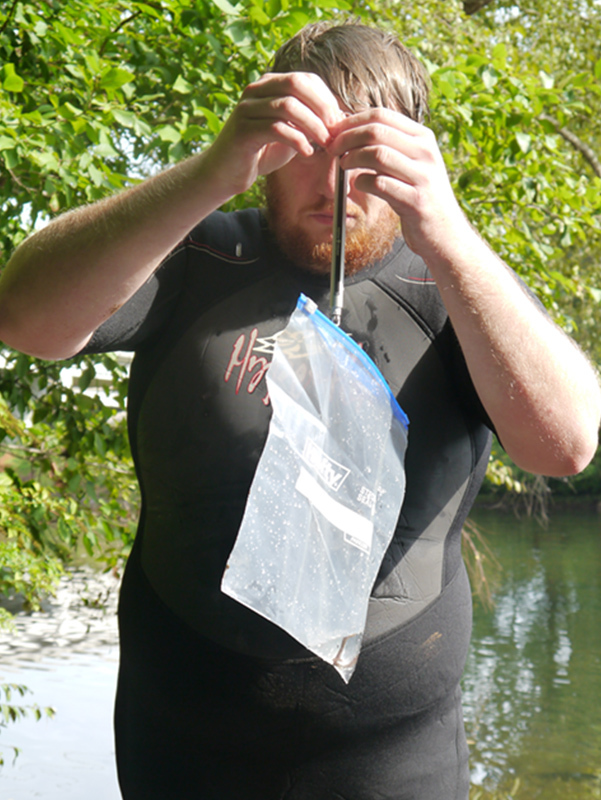 Although he’s sampling for mudpuppies and this one will add to the genetic database he is building, his real goal is to expand on an exciting discovery he made in this river: a salamander that may be a completely new species. He and his collaborators are finishing a paper that concludes they have either found a new mudpuppy or, almost equally intriguing, a separated population of a type known only to two rivers in North Carolina that drain to the Atlantic Ocean. “Either way, it’s pretty significant to species conservation,” Nelson says. Nelson’s collaborator Ben Fitzpatrick, a University of Tennessee associate professor of ecology and evolutionary biology, can recall only one other new Southeastern salamander species being discovered since the 1980s. Currently there are just five known species of mudpuppy in the Southeast. If, on the other hand, this “new type” is determined to be the same species as the Neuse River Water Dog (found in the Tar and Neuse rivers of North Carolina), that could have interesting implications for our understanding of Southern geology and evolution. Like many aquatic animals, salamander species are generally divided by the Appalachian Mountains. Each type lives either in rivers that drain to the Atlantic Ocean or those that drain to the Gulf of Mexico. Could the headwaters of the Hiwassee have moved over geologic time until they began to flow in the opposite direction? Nelson, Fitzpatrick, and Matt Neimiller plan to submit their research next month to the Journal of Herpetology. But they see these discoveries as only the first stage, so today, near an isolated mountain town called Reliance, Nelson has just spent five minutes chasing a salamander zipping through the leaf litter on the river bottom. Such is the life of a herpetologist, whose office is sometimes under a rock at the bottom of a swift creek. Nelson may have made a career-boosting scientific advance, but he wasn’t expecting it. This is just how he spends his time. Stephen Nelson dives for mudpuppies in the Hiwassee River, briefly bagging the elusive salamanders when he finds them under a rock or branch. The dark brown mudpuppy paddles about in the plastic bag, its feet large enough to look like baby hands with webbing between the fingers. Mudpuppies look very different from most salamanders because of their external gills. Some salamanders develop lungs as they mature, and others (like the largest salamander in North America, the hellbender) breathe through their skin. Mudpuppies not only keep their gills, they keep them outside their body: thin black extensions from their necks tipped by fluffy red fringe. It gives them a slightly comical look, reminiscent of a muppet. 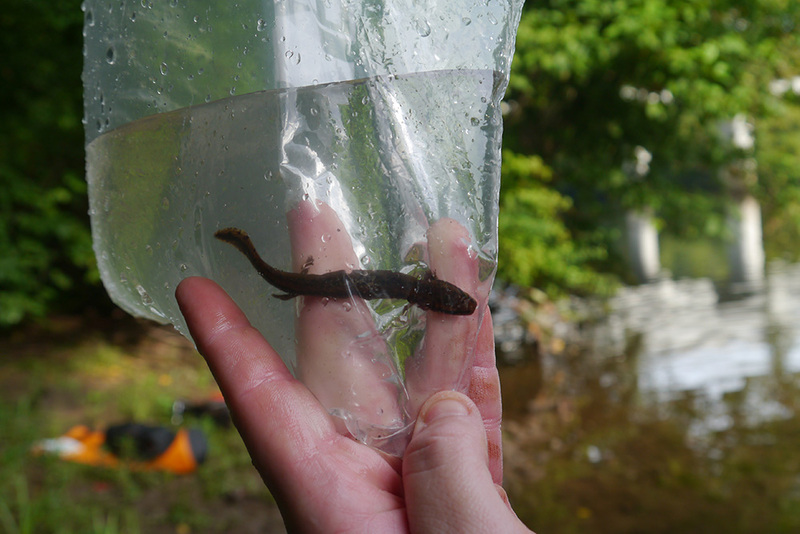 This mudpuppy might not fetch, but I can see why it received a friendlier nickname than the hellbender. The white coloring developing on this mudpuppy’s belly indicates it’s the common variety. The new type Nelson has been studying is about 25 percent smaller, more slender, and with fewer but more well-defined spots. This fellow is too small to weigh accurately or to tag, but Nelson records its estimated age, length (9.3 centimeters), and a description of its coloring before clipping off the tip of its tail and preserving it in a tube. Like many salamanders, the mudpuppy will later regrow its tail (and even a lost limb). The DNA in the tissue sample will later be analyzed to see if the two mudpuppy types in the Hiwassee are breeding with each other. Nelson snaps its photo before returning the mudpuppy to the exact spot where he found it and measuring the tree branch that had been its hiding place. The sun’s still not out, and Nelson is shivering in his short-sleeved wet suit. But just upstream of Cherokee National Forest he dives back in. He’s only got a few hours before TVA will release a huge plug of water from the Appalachia Dam, causing the river level to rise too high for the hunt. In less than an hour Nelson bags a hellbender while looking for his mudpuppies. This one isn’t nearly the two-foot-long monster it could become—it’s probably only four times as big as the mudpuppy was. Its eyes are clearly visible, and its lighter brown skin billows in wrinkly, floating folds, maximizing its contact with the oxygen in the water. Hellbenders, which are becoming even more unusual than their appearance suggests, are considered to be more threatened than mudpuppies for several reasons. They require free-flowing water and a rocky river bottom. Once a river is turned into a lake behind a dam, or is contaminated with muddy, chemical-laced runoff—no more hellbenders. They are very sensitive to poor water quality because they breathe through their skin. I think about my dad, who spent childhood summers flipping rocks in a search for salamanders in the foothills of western North Carolina. One of the many odd tidbits he shared with me when he was dying was a small, lifelong regret: He had killed a hellbender when he was a kid. It had scared him, and he didn’t know better. That happened often in the mountains. Some fishermen assumed the giant salamanders were gobbling up the fish stock, while others were just startled to find an enormous, biting “devil” on the end of their fishing lines. Both reacted by slaying the dragon. Although mudpuppies are more widespread and less sensitive, they nevertheless serve a similar purpose as an indicator of degraded water quality in rivers and lakes where hellbender’s don’t live, Nelson says. Nelson attempts to weigh the mudpuppy using a field scale, but the svelte salamander is too small for an accurate read. Hellbenders are what originally brought Nelson, Fitzpatrick, and Niemiller (at the time, one of Fitzpatrick’s grad students) to this river. Researchers were sampling in the Hiwassee and Little rivers to learn more about ranavirus and chytrid fungus, two types of infections that have been killing amphibians and salamanders globally. While looking for hellbenders, Nelson noticed some of the mudpuppies he saw looked a little unusual. When he did a summer internship with Purdue University that brought him in contact with more of the salamanders, Nelson became even more convinced that the ones he’d seen in the Hiwassee were not the typical variety. At the time, Nelson was earning his undergraduate degree in wildlife and fisheries science. He didn’t even have Fitzpatrick for a class, but he asked if the professor might allow him to use some leftover funding to test some of the Hiwassee mudpuppy tissue samples. It’s unusual for someone who is not being paid or graded to volunteer to do this level of science. But Fitzpatrick says Nelson took the initiative. As young as Nelson was, he had already racked up years of observing and researching amphibians, salamanders, snakes and turtles. He started volunteering at the Knoxville Zoo (now Zoo Knoxville) while he was attending Horse Maynard Middle School in Union County, and pretty quickly was allowed to focus on his greatest interest, the reptiles and turtles. He figures it was probably a relief to his parents. His mom, who was English, had a strict “no snakes in the house” rule. When he was 13 or 14, he sneaked a king snake inside, but it escaped from its makeshift Tupperware home. His mom found it in her bedroom. (She used a back-scratcher to deposit it in the yard, but it chose to return after a week, to her chagrin.) Nelson says his parents never realized his role in inviting their reptile visitor until he fessed up 10 years later. But Nelson fit right in at the zoo. He’d been volunteering there for a decade before he was hired part-time in 2011, then went full-time while he was still finishing college. Most people pursuing the kind of research Nelson is doing are working on a graduate degree. He’d like to do that one day, but he’s been having too much fun doing similar work for no credit. Nelson had already worked on two or three research projects for Fitzpatrick when he proposed the mudpuppy research. Fitzpatrick was supportive without expecting it to produce anything very interesting. At best, the scientist says, he figured it might lead to some kind of reclassification of Hiwassee mudpuppies. But realizing that two different mudpuppy species were living alongside each other was much more intriguing. Once initial DNA results came back, Fitzpatrick and Nelson got a grant from the U.S. Forest Service and the Wave Foundation to expand the DNA testing, snorkel surveys, and trapping salamanders by boat. Nelson returns the hellbender beneath its rock, then emerges a few moments later with a big splash to show off a striped-neck musk turtle the size of my palm. It opens its mouth as if threatening to snap, although a finger would barely fit inside. As I step deeper into the water to check him out, my waders compress tightly against the sweat pants I’m wearing over leggings. It’s 95 degrees in Knoxville today, but the water is just 67 degrees, and I’ve been warned about just how cold that will feel if it rises above my armpits to swamp the waders. Eventually Nelson heads across the river, which is wide at this point, to check the other side. I wait on the bank listening to the calls of cicadas, rising and falling like waves, and cars buzzing over the U.S. 441 bridge. Tiny paw prints, probably from a mink, dance through the mud next to me on a little “beach” which will be under water in an hour or so. Nelson slowly returns with another common mudpuppy, this one even smaller than the first. The zoo gives him the day off now and then for this sampling. When he pauses to check his phone, Nelson sees he has a message from a colleague at Cherokee National Forest. He dials and explains, “Sorry I didn’t call you back earlier. 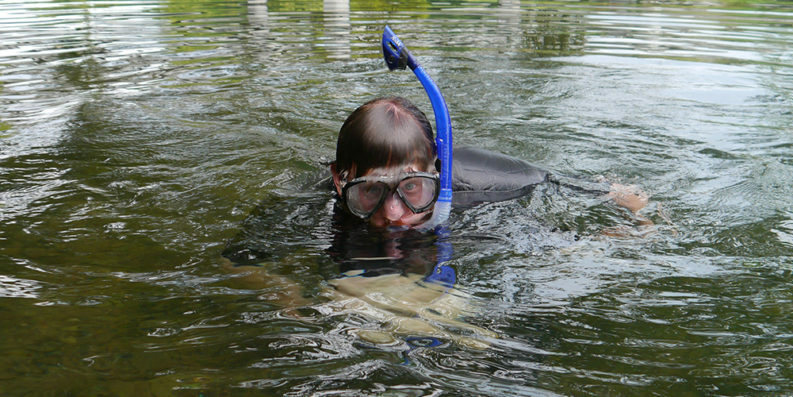 I was snorkeling away from my phone.” It’s an occupational hazard. Nelson says both the mudpuppies he caught today were juveniles, probably less than 5 years old. That’s a good sign. Biologists want to find animals of varying ages so they can be sure the population is still producing successful young. Still, he finds none of the new type of mudpuppies today. These mysterious, rippling-quick salamanders are slippery in more ways than one. Since 2011, Nelson and his fellow researchers have found just 55 of the unusual mudpuppies, all in the main stem of this river below the dam. Nelson and Fitzpatrick say they have looked in the Little, Tellico, and Ocoee rivers as well as a tributary creek of the Hiwassee without finding any more. But they might just be looking in the wrong places, Nelson says. And those are the unknowns about the most common mudpuppy species. What’s unknown about “the new type” of mudpuppy could fill this river. Fitzpatrick points out that there’s a slight possibility this population was transported from North Carolina to this river during the last few decades by fishermen using salamander eggs for bait. Alternately, Hiwassee mudpuppies could have been the same species as the Neuse River water dog in the distant past before becoming separated and evolving on different paths. The Neuse River water dog has been so little studied that it’s hard to quantify whether they’re different without more North Carolina tissue samples, something Fitzpatrick anticipates eventually requesting from wildlife and university officials there. 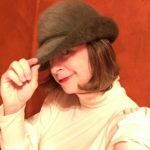 Even so, DNA comparisons aren’t as definitive as you’d think. Not long ago, scientists found that the three known species of North American wolves are genetically the same, with varying degrees of coyote mixed in. But they appear and behave somewhat differently, leading to disagreement on whether they are different species or not. We think of science as objective, but when it comes down to it, it still requires judgment calls—which can seem, well, unscientific. Although the team is ready for other scientists to review the first round of their results, they are already planning the next stages of study. They plan to use a relatively new technology to sample DNA floating in the water. This could help them identify places where the new mudpuppies live without catching them, because it’s clear that finding mudpuppies is a time-consuming endeavor with limited rewards. “For every hour we survey, we find .15 mudpuppies,” Nelson says. Put another way, it generally takes more than six hours of searching to find just one. On this trip, he’s found two mudpuppies and a hellbender in about four hours (not counting the four-hour round trip drive), while freezing and soaked.